As the Gallagher brothers tour the U.S. and world in separate bands hitting (or having already hit) a town near you-you must admit other than providing epic quotes for internet bloggers like myself to use, when together Oasis is a great band who played great music. 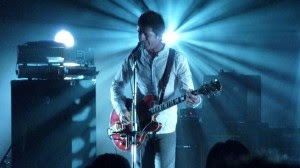 As Liam Gallagher tours with Beady Eye, a band that is essentially the rest of Oasis, Noel Gallagher tours with his own band-Noel Gallagher’s High Flying Birds. On a Monday evening, Noel rolled through Conan with those High Flying Birds to play “AKA… What A Life!”, proving two of my own personal theories. One, I need to get a hold of this album, and two-most importantly in the Gallagher V Gallagher heavyweight bout- Noel wins.